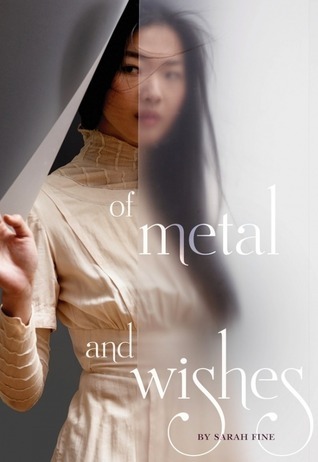 The first thing that drew me into Of Metal and Wishes was the cover. I love this cover! Yes, I know I have seen a ton of beautiful girls on YA covers, but the opaque veil she is standing behind gives this a great since of mystery. After reading the description I knew I wanted this bad. Hello, you can’t read the description without getting that awesome haunted gothic feeling… A slaughterhouse/ medical clinic, ghost that grant wishes!?!?! As if all that together isn’t enough to sound interesting there is going to be a relationship to build after an accident caused by said wish granting ghost… Oh I am all in on this one! The cover is beautiful and it sounds great! THAT COVER, wow! Great pick :-D.
This sounds like one scary book. Love it. I'll have to add it to my wishlist. Following you via GFC and Bloglovin'. :O I totally would have passed based on the cover - not that it's a bad cover - but I totally did not get slaughterhouse ghosts out of it. So glad I read your description! The cover is AWESOME! can't wait to read it! I haven't seen this one before but it sounds really interesting. I hope you enjoy reading it when it comes out. Great pick and thanks for sharing!